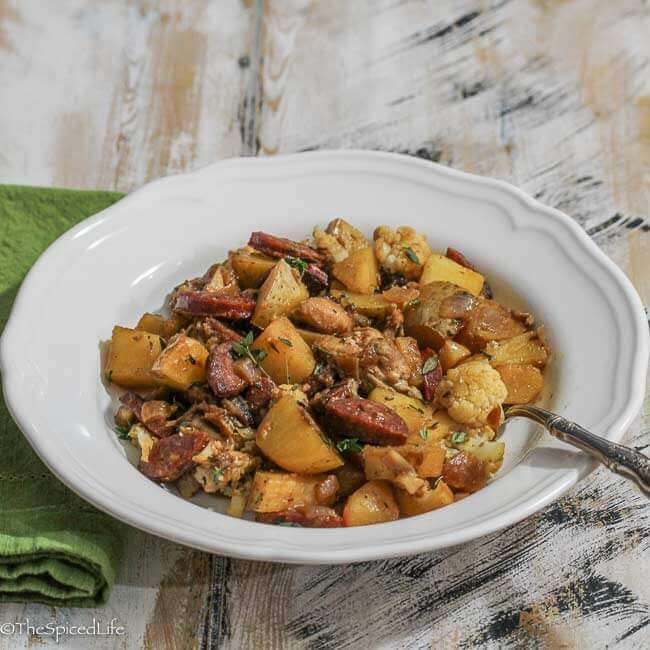 Polish Hash with Kielbasa and Cauliflower is a fun and delicious twist on hash, and it is perfect for a chilly winter night. I feel like most of my hashes have a similar vibe, so when I created this hash I challenged myself to create something different, look at different spices, etc. I also wanted to use some delicious Parma Sausage kielbasa I had in my freezer. So I started thinking Polish. Is it just me or does almost anything Polish in this country start out with sauerkraut? Sauerkraut is one of my foodie failings. To say I hate it does not seem strong enough. It drives me nuts that it feels difficult to explore my Polish heritage (my dad’s mom was Polish) through food since that is, after all, my thing. So I looked at some of the other spices called for in Polish cooking and decided to wing it. How did it go? 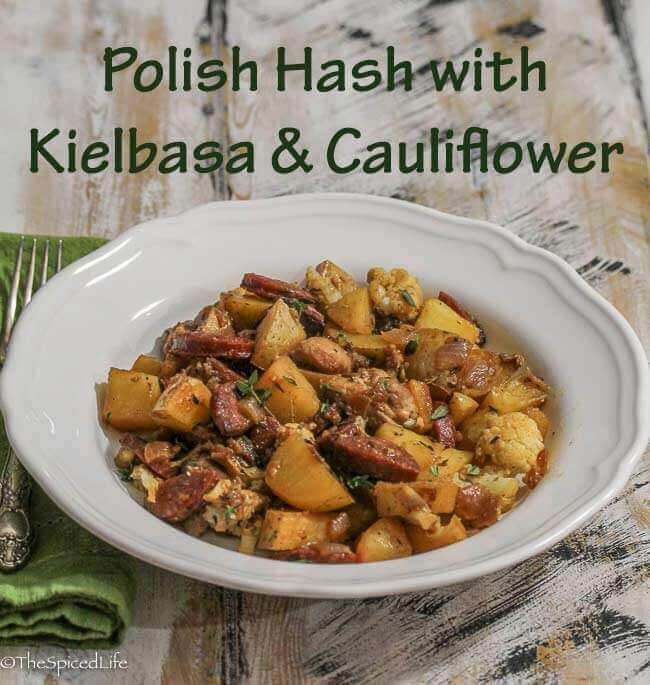 Well, this is a fact people: unless you are the random person who hates kielbasa the way I hate sauerkraut, you cannot go wrong with this Polish Hash with Kielbasa and Cauliflower, especially if you start with an outstanding kielbasa like the one sold at Parma Sausage. By sautéing the kielbasa first, the spices from the sausage flavor the entire dish, guaranteeing deliciousness. 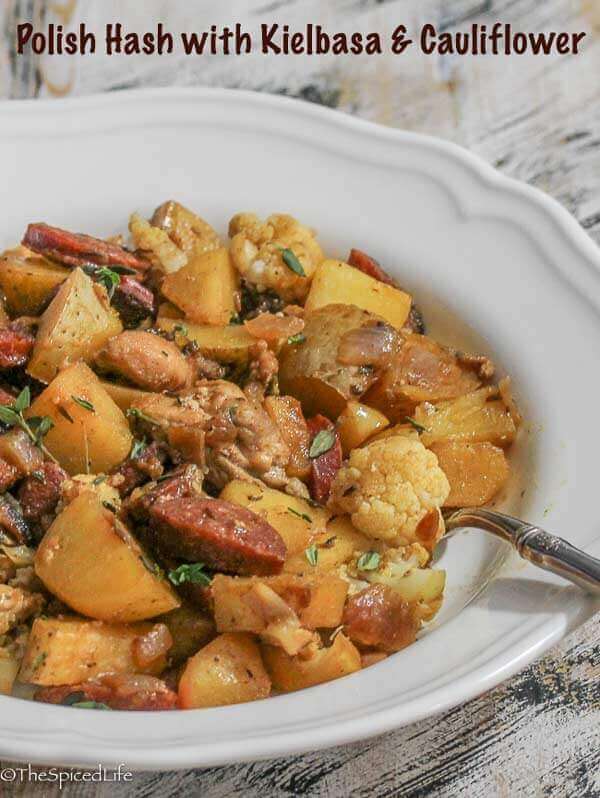 The caraway seeds and juniper berries definitely add an exotic Eastern European flavor, and the cauliflower keeps things healthy. I decided to add the apple because a hint of sweet helps almost every dish, and I saw so many recipes calling for apples (that also had sauerkraut) that I figured it was worth trying. They turned out to be my favorite part of the dish! On an interesting side note, I had a devil of a time naming this Polish Hash with Kielbasa and Cauliflower. I wanted to name it No Kraut Polish Hash. I thought it was catchy–and might attract other sauerkraut haters like me. Then I remembered kraut was a derogatory term in World War II (even though it also means herb or cabbage in German). Three of the four people I asked thought everyone would know I meant cabbage, but the fourth (John) was raised by someone super sensitive to German discrimination from that era and he was definitely made uncomfortable by it. I tried asking Google (I simply googled the word “kraut”) and literally all of the front page results were about using the term derogatorily. Of course then later that day I stared at all of the Cleveland Kraut fermented veggies at the grocery store. So what do you think? If you like sauerkraut, by all means try adding some, although you might not want to add the cider vinegar in that case. Heat the olive oil in a large, wide skillet over medium high heat and add the kielbasa. Brown the sausage, flipping over to get both sides. Then use a slotted spoon to remove the kielbasa to a bowl and set aside. Add the chopped onion to the hot flavored oil in the pan with a pinch of salt. Cook, stirring occasionally, until the onions start to brown. Add 1-2 tablespoons of cider vinegar to deglaze the bottom of the pan and scrape the pan clean of brown bits. Add the garlic, caraway seeds, juniper berries and bundled thyme. Stir. Add the potatoes and stir into the pan. Reduce the heat to medium and let them get browned on one side. Add the dark chicken meat and stir. Let the chicken brown a little and then add the white wine. Stir and reduce the heat to simmer briskly. Let the potatoes and chicken cook while the wine cooks off, 10-15 minutes. Add the cauliflower and apples and toss. If the pan is too dry, add a splash of water. Cover and let cook for 5-10 minutes, to get the cauliflower crisp-tender. Remove the lid and cook off any water. Stir the kielbasa back into the dish. Then stir in 1-2 tablespoons of cider vinegar and sprinkle with salt. Garnish with thymes leaves scraped off a few fresh sprigs. Taste for more salt or vinegar. Serve hot. I do not like sauerkraut either. Yuck! Honestly, I don’t ever remember Grandma making it. Ask your dad if she made it before me. I know Aunt Blanche and Aunt Genna made it. So, going to give this a try! I saved a chicken pineapple recipe from your blog that I want to try, also. Unfortunately, our stores do not carry some of the ingredients. It never seemed to me like Dad ate much Polish food at home–it was all Italian Italian Italian, but I will ask. And of course Mom loves sauerkraut so she definitely jumped on Polish food with it. Stuffed cabbage (still cooked cabbage!) is one of the only dishes I can think of seeing repeatedly without sauerkraut.